The hyperthyroidism panel checks for blood markers related to hyperthyroidism. What is the hyperthyroidism test panel? The hyperthyroidism test panel measures the free & total T3, free & total T4 & TSH blood levels. Why is the hyperthyroidism test panel important? The hyperthyroidism blood test can help identify treatable causes of hyperthyroidism. This Hyperthyroidism Test Panel is a blood test. This hyperthyroidism test panel, also known as a high thyroid test panel, hyperthyroidism lab test, hyperthyroid blood test, or an overactive thyroid blood panel, checks lab test markers that helps check for an overactive thyroid gland, or hyperthyroidism. The main problem that defines hyperthyroidism is that the thyroid gland is producing too much thyroid hormone. Thyroid hormones are involved with a number of processes that activate the body's metabolism. When thyroid hormone production is excessively high, these metabolic processes are accelerated, leading to symptoms of a metabolism on overdrive. Symptoms of hyperthyroidism include weight loss, hair loss, anxiety and mood disorders. Severe cases of hyperthyroidism are sometimes referred to as thyrotoxicosis. This hyperthyroidism lab test panel includes the free T3 test, free T4 test, total T3 test, total T4 test, and the TSH test. TSH, or thyroid stimulating hormone, controls the amount of T4, or thyroxine, produced by the thyroid gland. If you are hyperthyroid, the TSH is generally low although, in rare cases, it can be normal. T4 is an important hormone secreted by the thyroid and a high level often indicates hyperthyroidism, even if the TSH is normal. In cases of mild hyperthyroidism, the TSH and T4 may be normal. In that case, the T3 level can be helpful in identifying hyperthyroidism and determining the severity of hyperthyroidism. Getting a hyperthyroidism test near you at a Quest Diagnostics lab is a relatively straightforward process. After you order online, you will need to visit the selected lab near you and get your blood drawn. No fasting is required for this hyperthyroidism blood test panel. Most people with hyperthyroidism will show relatively low TSH levels and high T3 and T4 total and/or free levels on their lab results. The majority of cases of hyperthyroidism in the US are the result of a condition called Graves' disease - a disorder in which the immune system causes excessive thyroid activity. When checking for Graves' disease as the specific cause of hyperthyroidism, the Graves' disease test is a more useful test. Other causes of hyperthyroidism include inflammation of the thyroid and thyroid nodules and tumors. Hyperthyroidism is treatable using medications, radiation therapy and surgery. In many cases, treatment will involve destroying much of the thyroid resulting in the need for long-term thyroid hormone supplementation. For more advanced thyroid screening, consider the advanced thyroid panel or the comprehensive thyroid panel. 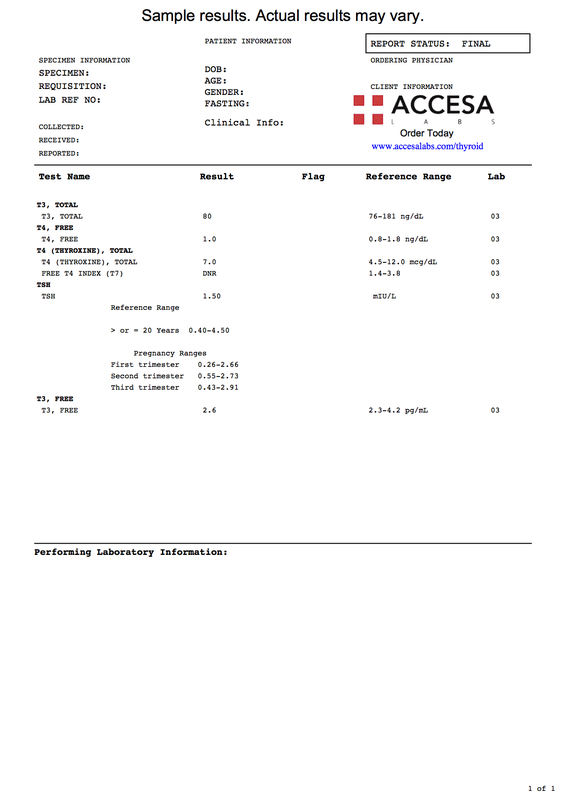 Hyperthyroidism Test Panel at Guaranteed Prices.